Of all types of golf lessons, I particularly enjoy giving beginners golf lessons. This is for two reasons. The first is to know I am helping to introduce somebody to a game that will give them years of pleasure. Golf is a fantastic way to get exercise and fresh air. Once you get the basics right with some golf lessons, you won’t spend too much time worrying about your next shot, and you will enjoy it all the more. The second is that beginner golfers are among the most enjoyable and easiest to work with. Some may worry that a PGA coach won’t want to work with them because they’re not good enough, but the opposite is actually true. Beginners have not yet picked up many bad habits. So, I can teach them to drive, pitch, and putt better from day one. Also, Beginners will see results much quicker than somebody who has been playing for years. As a result, they will get much more enjoyment from their golf. In truth, I enjoy watching their game develop too! In Beginners Golf Lessons, we start with the very fundamentals, including the grip. I will look at how you naturally grip the club, and advise on how you can improve it. Finding the best grip for you is a balance between core principles and individual style and preferences. But in many ways, it is the key to everything else. It is important to grip the club properly, and to keep it consistent. So together, we will find the best style for you. Then we will hit a few balls with the club of your choice. Don’t be nervous! Topping the ball, hooking, slicing, and even fresh air shots are all natural as you just begin to play golf. Mistakes are part and parcel of the game, and I have seen it all. Then we will identify some things for us to work on immediately. In fact, you could be surprised at the effect even one change can make, and the difference that even your first lesson can bring. As our time together continues, we’ll work on all parts of the game – driving, fairway woods, long irons, short irons, chipping, putting, bunker play, etc. You’ll learn all the fundamentals of golf and will quickly be at a level where you can play consistently. Just as importantly, you’ll be enjoying your play more too. Throughout all your beginners golf lessons, we’ll also be using my Trackman Pro system. This is one of the world’s leading 3D swing and ball flight analysis tools. It’s used by top professionals and top coaches worldwide, but it can deliver enormous benefits for beginners too. We’ll be able to break down your swing into all its individual parts. We’ll see how each of them affects how you hit the ball. Best of all, we’ll have even more proof right in front of our eyes of how the changes we make are improving your game. 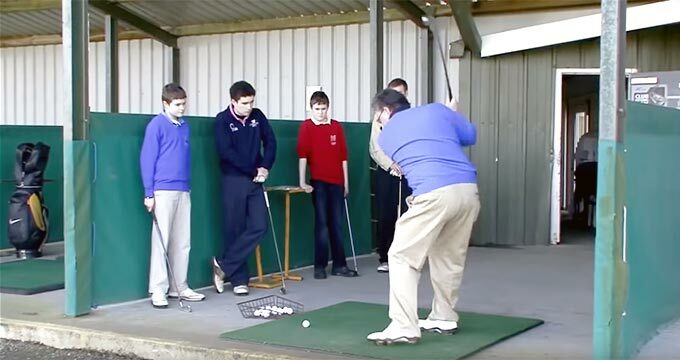 You can use my online booking system to book beginners golf lessons in Dublin, or contact me directly for lessons in Kildare at Athy Golf Range or Naas Golf Range. I look forward to working with you, and helping you to enjoy many years of golf!